This work was conducted by my former graduate student Jenny Grinberg. It focused on how a gesture vocabulary should be applied when gestures are being used in standard window interfaces (Windows, files and folders). We are currently in process of writing up the publication. Interface technologies have only started to adopt hand gestures and most human-computer controls still require physical devices such as keyboard or mouse. To evaluate the influence of keyboard interaction, gestures and combined interaction on user experience an existing hand gesture recognition system (developed by Stern & Efros, 2005) was integrated into a common Windows environment. Two experiments varied in the way the Gesture Vocabulary (GV) was introduced; bulk (Experiment 1) or gradual learning (Experiment 2). Results indicated that all gestures used in the GV were simple and could be executed within a relatively short learning period. Nevertheless, keyboard interaction remained the most efficient, least demanding, and most preferred way. Performance and subjective ratings of gestures and combined interaction were significantly different from those of the keyboard, but not from each other. Combined interaction was preferred over gestures-alone among women. With regard to the GV introduction, experiment one revealed that performance time and error rate with gestures were significantly higher for females than for males. However, gradual introduction of gestures (experiment two) improved females’ subjective satisfaction, decreased their performance time, and did not worsen error rate. For males, no such differences were found. Men and women related differently to the gesture displays and women perceived textual labels as more useful. Here is a screen shot of the application consisting of a standard window which enables to perform the most commonly used commands with folders and files (e.g., open a folder, move the cursor to the right folder, etc.) via hand gestures or via keyboard. 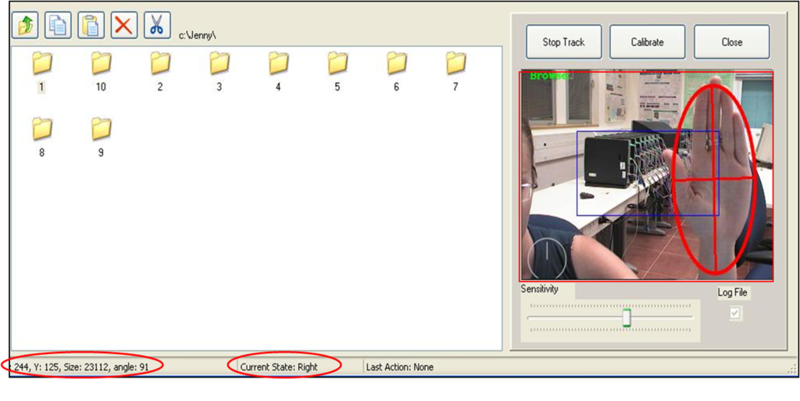 To the right is the gesture feedback window (which is part of the gesture recognition system developed by Stern & Efros, 2005). Nine dynamic gestures were defined with one of them as the start/end position. The other eight represented the most commonly used commands in file management navigation processes; right, left, up and down, entering and exiting a folder, and copy/paste commands. Here is a video demo of the various gestures used. Initial findings were reported in Grinberg J. and Oron-Gilad T., Utilizing Hand-Gesture Interaction in Standard PC Based Interfaces, proceeding of the International Ergonomica Association IEA 2009, Bejing, China. This entry was posted on February 27, 2011, 18:38 and is filed under Gesture interaction, Gesture vocabulary, human factors engineering, News. You can follow any responses to this entry through RSS 2.0. You can leave a response, or trackback from your own site. Sorry but the source code for the gesture interaction algorithem belongsto Prof. Helman Stern.